Django. D-J-A-N-G-O. The "D" is silent. Django Unchained starts off with Django's unchaining and from then on addresses old-school racism, the way slaves were treated, just how much blood can come out of one person, the possible origins of the KKK, and the effects of dynamite on various substances. Christoph Waltz plays a dentist-turned-bounty hunter Dr. King Schultz. Schultz buys and subsequently frees Django (Jamie Foxx). He treats him as a friend and equal through thick and thin. Slavers and slaves alike are shocked, and some react forcefully to the fact, that Django is free, rides a horse, and is equal with Schultz. 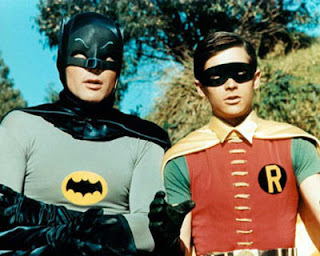 The dentist teaches Django the art of bounty hunting and the two become partners in crime. Well, not really crime. They're sort of stopping crime, I guess. Not exactly what I meant. Schultz teaches Django everything from shooting to reading. Schultz despises slavery and hopes to see it eradicated. The most fascinating part of his character is watching as a man who kills for a living becomes more and more disgusted by what slavery is and does to people. Django's wife, Broomhilda von Schaft (played by Kerry Washington), was named for a princess in German legend, and Dr. Schultz (a German himself) is more than happy to tell Django the tales of how Broomhilda of legend was rescued by her lover Siegfried--a man who walked through hellfire to get her back. As Django's Broomhilda is still a slave, the two bounty hunters decide they'll play Siegfried and save her. Broomhilda's owner is the infamous slaver and landlord Calvin Candie, played by Leonardo DiCaprio. He insists that others call him Monsieur Candie (but don't try to speak French to him, he doesn't speak a lick). In the middle of a very angry, very long rant, Monsieur Candie cuts his hand badly (even required stitches) when he smashes his hand on a glass, and completely disregarding it, he just keeps going. Through pages and pages of angry southern plantation owner monologue. And it's cool. He doesn't break character, and the shock on the other actors' faces only adds to the drama of the scene. He goes so far as to smear his own blood on Kerry Washington's face. He calls his plantation "Candieland." 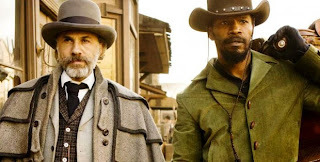 Django does what he needs to: he plays the system in order to be with Broomhilda again. Samuel L. Jackson plays Stephen, a nefarious old slave who has patiently and obediently worked his way to his position as Candie's right-hand man. Each man gives his heart and soul to his own cause. One hopes to be free, the other finds "freedom" in his high station. Stephen is reprehensible; he sells out his own kind to gain respect in the eyes of his owner. He never cares that he is owned, he simply feels that he has earned himself the title of family member. 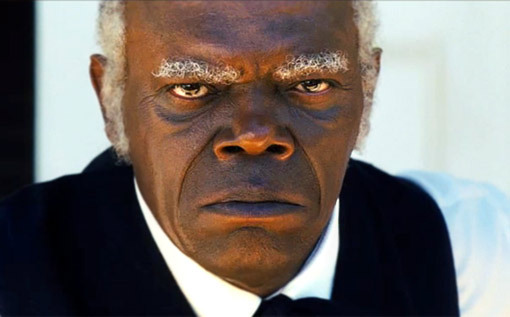 He is disgusted at Django--a man who escaped the same system that gave Stephen everything he has. Django may kill men for a living, but Stephen is the real degenerate. Angriest version of Lucius Fox I've ever seen. There's more, but I don't want to spoil it for anyone. 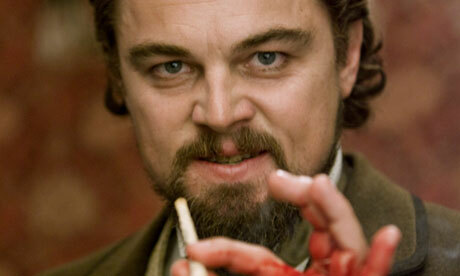 In short, Django is a crazy story that plays out better than you'd expect. Quentin Tarantino, I tip my hat to you. Ladders...Oh, and I'm new here.